Sectolin cares for animal for more than 80 years. The history of Sectolin goes back for more than 80 years. Our company was founded in 1936 and in that time Sectolin sold all kinds of cosmetic products, even baby powder. Thirty years later the focus of the company changed from human to animal and since the 80’s we fully tend to concentrate on hobby pets, specialized in Horses. 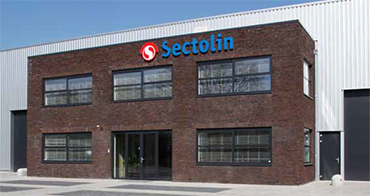 Thus Gert-Jan Morsink, as third generation in a row owner of Sectolin. In the meantime Sectolin is an established brand in the horse world. Which person who takes care of a horse does not have one or multiple of our horse care products in their saddle room? Nowadays we work from a new building on the Josink Es, on the edge of Enschede and near the highway. A strategic place on an industrial estate, but with a phenomenal view on the Dutch landscape. At this place we feel at home and with the nature as source of inspiration we develop the most innovative products for animals and their environment. As someone who loves animals, you want the best for your horse, dog or cat. A save and trusted, hygienic environment in which the animal is the central point and an optimal care is essential. Thereby we believe that preventing is better than curing. If prevention is not enough, then Sectolin offers a wide product range of animal care products and health products. All of our products are designed and developed with the health of the animal as central point. Of course our products do what they promise they do and are easy in use. If it’s somewhat possible, then we use natural components. If that’s not possible, then we choose save alternatives which are as durable as possible. Sectolin, lasting an animal live! Sectolin products are designed and developed with the health, care and protection of horses in mind. For horses, the assortment varies from Equivital horse supplements and the healthy horse treat Vazuintjes till cooling gel and deworming paste Equiworm. For the care products, like shampoos and shine sprays, we use the name Equishine. We also have shavers and leather maintenance products. We help you to protect your precious horse as good as possible: against summer inconveniences like flees and sunburn, and through products like the Safety First headstall. We are always busy to invent and create more useful or handy products for horses. That has led to our own horse riding product line ‘Chetaime’. A name that reflects the love for horses. At this moment we have among others the safety headstall, rugs, protecting seat covers and saddle beans in the assortment, that is still growing. Through the success of our horse care line we got the question of Sectolin customers whether we could made such products for dogs and cats. We already have various shampoos and fur care products for dogs and cats in our assortment. An unique product is our Vlo & Mijt Omgevingsspray. This spray is, unlike similar products, is free of pesticide and safe for the environment of human and pets. Moreover it is at least as effective, perhaps more effective, than similar products. That is typical Sectolin. We invent and develop our products together with professionals like veterinarians, nutritionists, farriers, instructors, top riders and their grooms. We also frequently ask the user of our products to share their experiences. With that feedback Sectolin is capable to develop beautiful products and we keep innovating and renewing. Because we think that everyone who love animals got to have the possibility to take care as good as possible for their horse, we see it as a challenge to deliver the best quality for an affordable price.